Ask parents about camping with their children, and you’ll hear some wildly-conflicting views. Sleeping under canvas can be challenging, especially with younger children – but camping with your kids is one of the most rewarding breaks you can have. Personally, a camping holiday is a must in our travel diaries for the summer; it’s cheap, a great way of getting the kids outdoors, and a brilliant introduction to activities they might not have tried before. If you’re booking a camping break this summer, make sure you use these tried and tested parenting hacks. You may still find ants in the jam and struggle with the tent, but you’re pretty much guaranteed to have a great time with the family. Here are seven recommendations to keep your brood happy, content and well-fed on a family camping trip. A few weeks before you leave, practice putting the tent up in your garden at home, and check that you have all the kit that you need – especially spare tent pegs, ground sheets and a mallet. Not only will this give the tent an airing, but you’ll also be able to replace any missing parts and check which spares you might need. You’ll also feel more confident about putting the tent up when you arrive. You can even have a trial run and enjoy sleeping out in the garden for a night – with the safety of all your amenities just the other side of your back door! Try and do it as soon as you arrive – and in daylight! Check the ground for ants – if you pitch up on their nest, you’ll know about it fairly soon. Set aside an area outside the tent with a ground sheet and a couple of doormats, and use this as an area for people to leave their shoes. Create a house rule which everyone sticks to – no shoes allowed inside the tent, at any point. If you’d like to make the floor a little bit softer, bring interlocking foam tiles or a clean square of cheap carpet. Even if the weather’s set to be scorching, make sure everyone has pillows, a good quality sleeping bag and a few extra blankets. You can always pop them in the car if you don’t need them. Remember to bring a selection of PJs for everyone, from loose-fitting cotton nightwear to thermals – just in case. Fleeces are especially handy for warming up in the evenings. If your kids aren’t big on food and you can tell they’ll play up, it’s ok to cheat. Bring cereal bars and plain biscuits from home, and top them with waxed cheeses, such as Babybels. Don’t forget to bring jars of pesto or tomato sauce, and you can boil pasta in just a few minutes for a healthy staple. If you fancy rustling something special up, you can make a campfire pizza. Bring a pre-made pizza base and place it on your grill, on a sheet of foil. Add tomato sauce, cheese and all the toppings you’d like – just serve when the cheese is melted. Never bank on good weather, or the allure of a treasure hunt. Bring as many toys and books from home as you can – you’ll be grateful if the weather takes a turn for the worse and you’re confined to the tent. Don’t bring anything which won’t withstand a bit of dirt or a long car journey. Tablets and other electronic devices quickly run out of battery, so now’s the perfect time to resurrect an interest in UNO or Monopoly! Bounce dryer sheets. These are supposed to keep mosquitoes and other bugs away. There’s no guaranteed science behind it, but a lot of parents pop them in their kids’ pockets to keep the bites at bay. 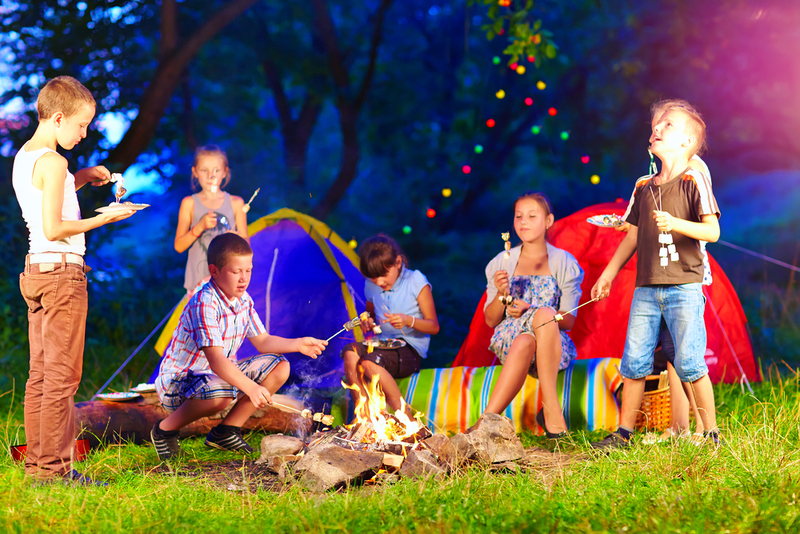 Hopefully these tips will help keep your family safe and happy so you can all get the camping bug, but don’t forget insurance. There’s a good chance you’ll never need it, but if you or your family need medical care while you’re away, it’s worth looking at Columbus Direct’s travel insurance. It provides up to £15m of cover, so you can carry on having fun, safe in the knowledge that you’re protected. Camping image courtesy of Shutterstock. Post written in collaboration with Columbus Direct.